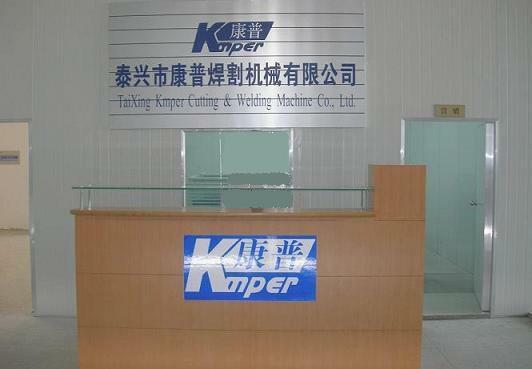 TaiXing Kmper Cutting&Welding Machine Co., Ltd., lies in the Science Technology Industrial Park, Taixing city, has more than 90 specialized personnel of debugging, installing development, design, sample, makes, and the product-examining, etc., specialize in the reseach,produce and sell of the numerical control cutting machine.The company has a piece of experienced scientific and technological ranks, have the ability of different new products of designing and development, through introducing the advanced technology both at home and abroad, the serial numerical control flame / plasma cutting machine has already become the essential cut apparatus of large-and-middle-scale mechanical manufacturing company such as shipbuilding industry, electrical machinery, chemical machinery, metallurgical machinery, and also already become the products that users have really needed. Our company is adhering to innovation all the time, grasping the latest information, incorporating the latest technology and develop, and keeping step with the advanced international standards in product development constantly. We enjoy good prestige among users with our reliable product quality and the prompt after-sale service.he factory has equipment workshop of more than 2000 square meters in area and the related-part processing workshop of more than 1000 square meters, and has the production capacity of producing the various types of cutting machine. The streamlined production line has got the satisfaction of the masses of customers.Matching the masses of requirementing of customer, we insist on with " customer the highest, quality first, serve first " as factory aim all the time, give to the customer with the high most quality products.